Felt Christmas Unicorn Ornament - Sew What, Alicia? I love Christmas and crafting for Christmas is SO fun! It just makes my heart happy. I have LOTS of Christmas crafts and sewing coming your way, check out THIS page for all the fun Christmas tutorials. If you need more felt ornaments scroll down to see a whole list of fun felt ornaments to sew. These unicorn Christmas ornaments are great if you don’t have a sewing machine or you want to teach your kiddos to hand sew. These come together quickly. They make a wonderful gift. You can use the SVG below and make it much larger to create a fun stuffed unicorn as well. Or scale the pdf pattern to achieve the same result. You could make this sweet unicorn in so many different colors. Try playing around with the size and colors to really make this Christmas unicorn your own! The kids will absolutely love helping with this cute project. These would be perfect for attaching to a gift. You could also create an ADORABLE mobile for the nursery with these sweet unicorns. These unicorns are great for Christmas but they are also great year round for your unicorn projects. Cut the template from the felt. 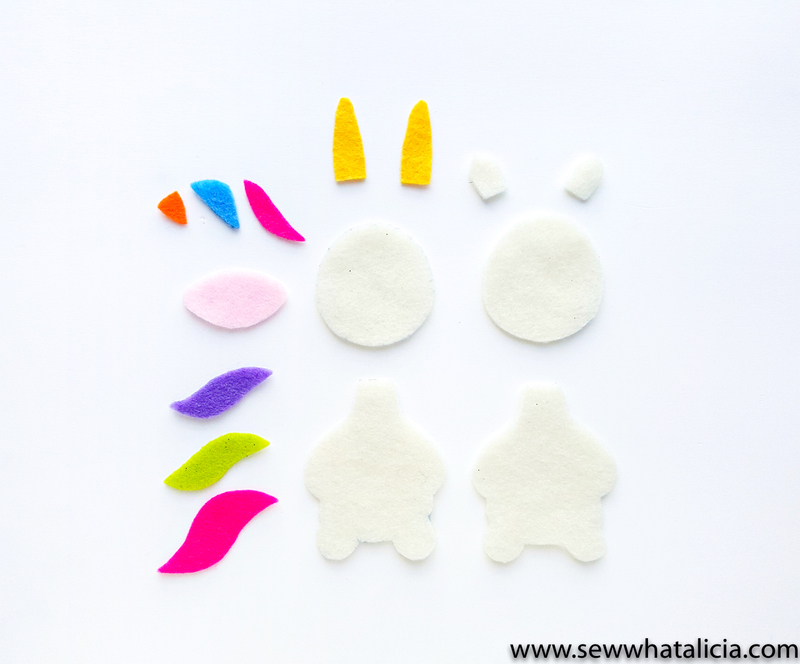 You can use your Cricut Maker to cut felt, see all my tips for cutting felt with the Maker HERE. You can also use the PDF template above to cut the pieces out by hand. Start by using a blanket stitch to sew the two pieces of the horn together. You could also use a straight stitch if you prefer. This is a small piece so I would skip trying to stuff the horn. Next add the face details. Sew the pink face onto the head piece and then add eyes, nose and mouth. Line up the ears, bangs, horn, and ribbon between the two head pieces. You can use a touch of fabric glue to hold these in place while you sew around the edges. Sew around most of the head piece and then stuff with filling to give the head some dimension. Sew around most of the head piece and then stuff with filling to give the head some dimension. Then finish by closing the opening in the head. Now move to the body. Line up the two body pieces. Again sew around most of the body, leave yourself an opening to stuff with filling. Stuff and then close the opening. Line up the body piece with the head piece. When you are sewing the head onto the body be sure to only go through the white felt layers. This will hide the stitching and keep extra stitches off of the pink mouth piece. Last add the mane hair in the back of the unicorn. Again be sure to keep the stitching away from the face layer. Tada! Now you have an adorable Christmas unicorn! Hi, great tutorial but templates are not working at all!